I have newly planted strawberry plants this year. They seem to be doing fine. I just came across this somewhere and wondered if I am supposed to be doing this. Please let me know exactly what needs to be done. Thanks in advance. good point, I too would like to know the answer to this. That is what all of the instructions always say. I never pay any attention however as getting a batch of berries that first year is more important to me than runner production. Plants most always produce far too many runners, and those excess runners have to be pinched in order to keep the number of plants in check. I planted 150 new strawberry plants this year and didn't pinch a singe bloom. Berries will begin ripening soon, but yesterday I noticed that some of the plants have already started producing runners, inspite of the fact that the berries have not begin to ripen yet. There is certainly no danger of having inadequate runners. I was able to plant my berry plants very early in the season, about two months ago. If planting now, perhaps would have to consider removing blooms, as the plants would not have a chance to get settled in before blooming and berry production, and that would be quite a drain on plants that had just been planted. What do you mean by runners? Is it kind of like the plant starts branching off as another plant or what? Strawberry plants multiply freely by producing runners which grow across the ground and set a new plant about every ten inches. If left alone, a single runner will grow several feet across the soil and will produce several new plants. A single strawberry plant may produce anywhere from six to a dozen runners during the season. 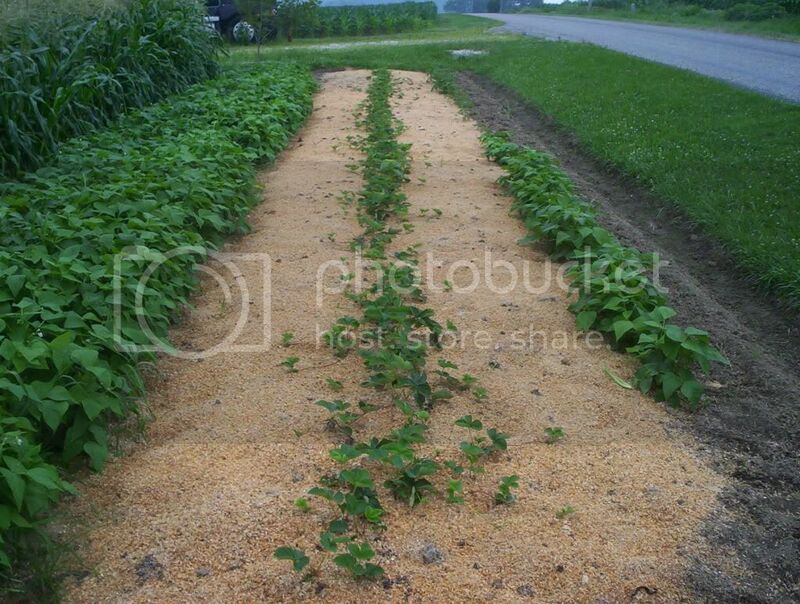 This runner production will both crowd the bed and will weaken the parent plant if not managed. I generally will not allow a parent plant to make more than 2-4 new plants in a season. The rest of the runners, or the continuation of a runner are all pinched off. That way the parent plant and the new plants can channel more energy into fruit production for the next year. Thank you for all your information. You've been very helpful! Can you be more specific about how to pinch the runners and where to pinch them. Can these be saved to make new plants? There is nothing overly precise about 'pinching' the runners. You can cut them close to the mother plant or not, it doesn't matter. They can be snapped, pinched, cut it doesn't matter. If I want to use a runner to start a new plant, I either place the new plant in a 1 gallong nursery pot or place the plant from the runner at a spot where it will grow in the bed. I generally will cut off any extension that starts to form a second plant. If you just leave a runner to its own, it will extend out and will start two or three or even more new plants. It goes out about a foot and sets a plant, then continues on another foot and another plant, and will even keep on after that. Each time the runner continues, it is robbing a little energy from the mother plant and from any plant before it. So it makes sense to pinch or cut any runners that you do not wish to make new plants. Can you pinch off the runners and then put them in soil to produce new plants or do you need to let them produce roots before cutting them from the mother plant. Best Growing conditions for Strawberries? This is the second year I have has strawberries. The first year the plants produced very little fruit but they produced runners like they were going out of style. My question today is that I have to rearrange my garden a little and the strawberries have to be moved. Would you suggest a raised bed, flat ground, strawberry boxes? I've heard so many techniques...I'm wondering what the opinions of the group are? amatuergardener wrote: Can you pinch off the runners and then put them in soil to produce new plants or do you need to let them produce roots before cutting them from the mother plant. The runners are like long thin stems with a tiny plant at the end. If you want more plants, leave them. If you don't, cut them off. You can position the runner so that the plants grow in rows. You can also cut them and put them where you want once the plant is big enough. You'll have so many you'll wonder what to do with them. Here is a good picture of runners. The parent plant is on the far left. Following to the right is the 1st new plant, which sent out a runner to make a 2nd new plant, which sent out a runner (lower right, barely visible) that is just forming a leaf and will send roots down in a day or two. I usually have a fairly large strawberry patch. The last patch I had produced 80 gallons in the 4th year after setting out 75 plants. One problem though, was that all the berries were small, which made a lot of extra work. That was also the year that I accidentally killed the entire patch. Production from the parent plants will slow after 3 or 4 years. In the past, I would allow the patch to grow unrestricted. After the first 2 or 3 years, it would start getting overcrowded and the berries would start getting smaller. I intend to change my strategy in this new patch and manage it following the guidelines of a gardening book I bought 17 years ago. I set out 29 plants this spring, and did pinch the blooms because I want it to expand as rapidly as possible to have a larger crop next year. By the fall of 2010 the single row of 25 plants that I set out this year should branch out into a wide row approximately 4 feet wide. I will run my tiller straight down the center taking out the parent plants and then put mulch on top of the freshly tilled soil. This will give me 2 rows approximately 15" wide and the runners will be the new parent plants. The next fall new runners will spread out making a single patch again approximately 6 or 7 feet wide. I will then run the tiller through where I had made 2 rows the previous year resulting in 3 rows. Every year I will be removing the parent plants from the previous year. This method has several advantages. It will renew the patch every year. It makes it easier to pick the berries. It helps with weed control. My patch will grow larger every year. rdesil wrote: I heard from a couple people that strawberry plants LOVE being with other strawberry plants (They are very Social) and like to be crowded by others, and now i just read about that the plants need to be less crowded to yield a larger crop. So which is it? If you let them get crowded they will produce more gallons per acre (or cups per growing container) because there will be lots of berries. If you keep them less crowded, the berries should be larger, but the total yield will be less. That is the same basic principle with many crops. What to put under strawberry plants? Where Can I Buy Strawberry Plants?